What is a frost-heaved bedrock Illustrative Feature? The illustrative features presented in this section are hills, ridges, individual rocks and other bedrock features chosen to illustrate potential processes underlying bedrock disruption by ice. The selected features are key to understanding why particular processes, for example, cold-based glaciation or hydraulic bedrock frost heave, have been singled out as possible explanations for field observations in Heart of Avalonia. The illustrative features listed below were picked to highlight the best examples of bedrock glacial geomorphology that appear to offer the least ambiguity in interpretation. Each geomorphic feature is described in detail with the goal of linking ice-induced bedrock disruption with specific aspects of ice/groundwater behaviour, glaciation, deglaciation and paleoclimate. The discussions of the illustrative features are deliberately thorough, including measurements, diagrams, photos from multiple angles and descriptions, all aimed at providing (almost raw) evidence. 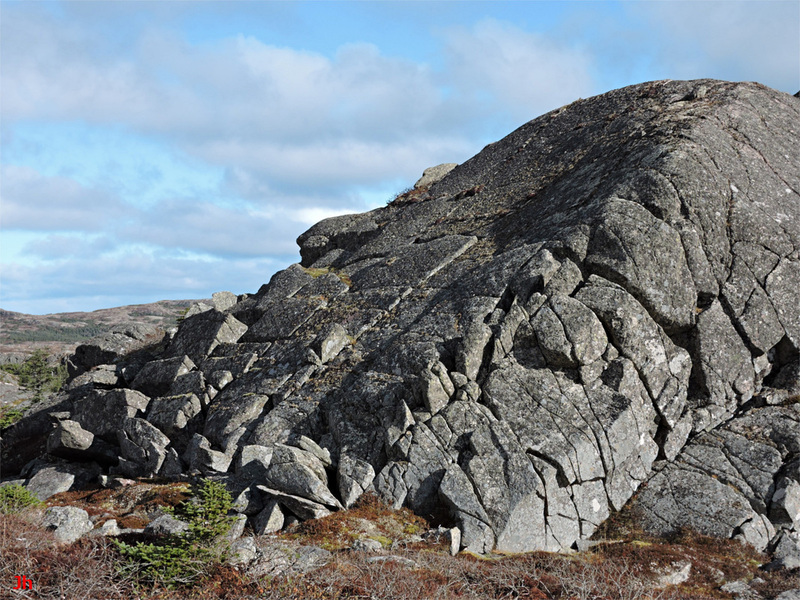 It is hoped that the interpretation of this evidence can lead to a better understanding of the complex, varied and intriguing processes that created the ice-disrupted bedrock features in Heart of Avalonia. Each illustrative feature is referenced by "IF-" followed by a 2-digit number. For example, Illustrative Feature 1 is referenced as IF-01. ​IF-01: Investigating the link between frost-heaved bedrock and glacial activity. IF-02: Bedrock frost heave occurring beneath glacial ice. Probable hydraulic bedrock frost heave. IF-03: Bedrock disruption beneath thick cold-based glacial ice. Subglacial frost heave. ​IF-04: Alignment of dislodged frost-heaved joint blocks by ice creep. Subglacial frost heave. ​IF-05: Subglacial bedrock frost heave and plucking. Linking the two processes. IF-06: Bedrock disruption by subglacial ice segregation. Cold deglaciation. IF-07: Slow-motion plucking beneath a cold-based glacier. A close examination. IF-09: Bedrock erosion by subglacial ice extrusion.